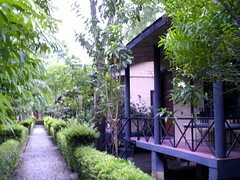 My trip to Royal Chitwan National Park was great, if very brief. 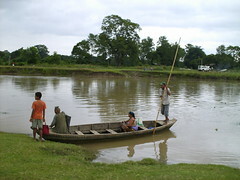 Chitwan is on the southern border of Nepal, and the park itself eventually gives way to India. This area is the Tarai region of Nepal, the hot, flat lowlands of the country. I was warned that there would be oppressive heat – and while it was very hot, my what I had imagined (and experienced in Doha) was worse than the actual temperature.It was great to get out of the smog and congestion of Kathmandu and see the other Nepal. Kathmandu has about 2 million people out of a total population of about 28 million Nepali. Having a chance to go to another part of Nepal was a great experience – and the differences were stark. For starters, the air was wonderfully clean – it was a great to be able to really breath, even if only for a couple days. Kathmandu isn’t too bad, but in the streets during rush hour (like any major metropolitan centre) is a bit much to take. I landed at Baharatput Airport, the closest city to Chitwan. This city was similar in many ways to Kathmandu, if less dense. 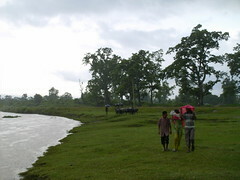 Once we left the city, we headed towards Sauhara, a small village which is the closest settlement to Chitwan Park. My guide called it “Little Thamel”, because while very small, it is still full of tourists <grin>. 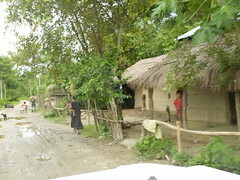 I was surprised to see that in this area mud huts with thatched roofs are the standard housing once you leave the city. These small, low huts are usually grouped together and invariably have a water buffalo, some goats and chickens running about. The primary crops in this area appears to be maize and rice, with endless acres of rice paddies stretching out in every directions. While the housing and communities seem rudimentary and poor, filled with long hard work to provide for their families, this part of the world is filled with amazing beauty, and everywhere I went the children were happy and laughing and playing. The drive to my accomodations, the Maruni Sanctuary Lodge, was an adventure in off-roading in a Land Rover. The Lodge itself was very nice, with guests staying in their own little cottages. 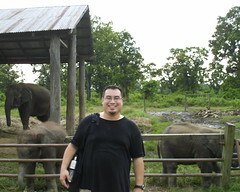 The Elephants were great and it was really interesting to learn about the breeding program. They’ve built the population from just over 10 to over 50 since the program started. And I never realized that a baby elephant could be cute! We got caught in the rain on the way back – the rain here is warm and gentle, although it is also very patient and can last a very, very long time. On the way back I even saw small groups of Water Buffalo crossing the river. It was a lovely afternoon. The next day we were up at 5:30, despite the rain, to go for our elephant safari. After another bumpy ride out to the park, Brad and I squeezed ourselves into the palanquin on top of the elephant and then…we entered the jungle. Riding on an elephant has its own special rhythm as the elephant strides across the jungle, clearing the path with its trunk, or even just breaking small trees if they’re in the way. The elephant may have been slow, but I don’t think there is another form of transportation that could have gone where we went on our safari. The jungle is opened by paths that have been cut through the park, but the jungle hasn’t yielded and eagery grows and moves to reclaim the paths. Huge trees, and branches, leaves and vines brushed past as our elephant meandered through the jungle. It was a thrilling and totally unique experience for me. We were very lucky and managed to see a one-horned rhino – they are quite rare with only a few hundred in the world, and I believe the majority are in Chitwan park. 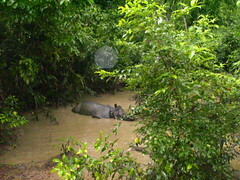 The trip to Chitwan was an amazing, once-in-a-lifetime experience. 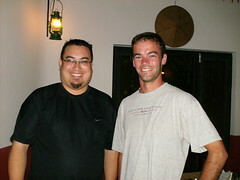 I got to be in the jungle, see another world, watch a rhino take a bath and ride an elephant. It was a day to remember. Are there any pictures of you on the elephant? That is so awesome! Did you give the elephant peanuts? I hear they like peanuts. 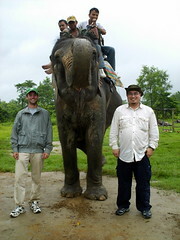 I can attest to the fact that Sean was indeed on the elephant. Great time ambling through the jungle!